Has Warren Buffett Finally Found a Winning Big Oil Investment? Berkshire Hathaway CEO Warren Buffett's big investments in oil majors hasn't gone well in recent years. Will his latest big investment in Phillips 66 pay off? Buffett has 61,486,926 reasons why he hopes Phillips 66 does well. Berkshire Hathaway (NYSE:BRK-A) (NYSE:BRK-B) CEO Warren Buffett is one of the greatest investors ever. But when it comes to investing in Big Oil, the Oracle of Omaha hasn't had the kind of success that he -- and shareholders in Berkshire -- have become accustomed to. But it looks like he's going back for more: In the recent release of Berkshire's 13F filing with the SEC, the company disclosed that it had more than doubled its holdings in midstream and downstream integrated giant Phillips 66 (NYSE:PSX) in the third quarter. According to the filing, Berkshire bought more than 31 million shares of the company, putting Berkshire's total holdings in Phillips 66 stock at 61.5 million shares. Add it all up, and Berkshire now owns more than 11.5% of the refining and petrochemicals giant. Is Phillips 66 going to help Buffett end his bad streak with Big Oil, or is this destined to be another underperforming investment? Let's take a closer look. [L]ast year I made a major mistake of commission (and maybe more; this one sticks out). Without urging from Charlie or anyone else, I bought a large amount of ConocoPhillips stock when oil and gas prices were near their peak. ... Even if [oil] prices should rise, moreover, the terrible timing of my purchase has cost Berkshire several billion dollars. Berkshire sold the majority of its stake in the company at a loss in 2009 to help fund the acquisition of BNSF Railways, but held the remainder through 2012, when ConocoPhillips split the midstream/downstream into Phillips 66. Berkshire received 27 million shares in the spinoff; but in 2014, it swapped 17 million of those shares with Phillips 66 for part of its chemicals business. In other words, Buffett is quite familiar with Phillips 66's business. What does Buffett like about Phillips 66? Phillips 66 has a few characteristics that Buffett has long talked about as advantageous. To start, the refining industry has extremely high start-up costs, which limit competitive entry. There hasn't been a new major refinery built in the U.S. in decades; the expansion of existing facilities has been the source of output growth. Additionally, the company's big investments in additional petrochemical manufacturing capacity near the U.S. Gulf Coast benefit from plentiful, cheap American natural gas. This creates a price advantage against petrochemicals manufactured overseas with more expensive oil-based feedstocks. Maybe most importantly, essentially all of Phillips 66's businesses produce steady operating cash flows and earnings without significant seasonal or cyclical shifts, while its profitability is much-less tied to the price of oil and gas. This is very different than integrated companies or independent exploration and production companies, which can see their revenues (and profits) swing wildly with shifts in oil and natural gas prices. PSX EPS Diluted (TTM) data by YCharts. As you can see, Phillips 66 has produced steady cash flows and earnings. 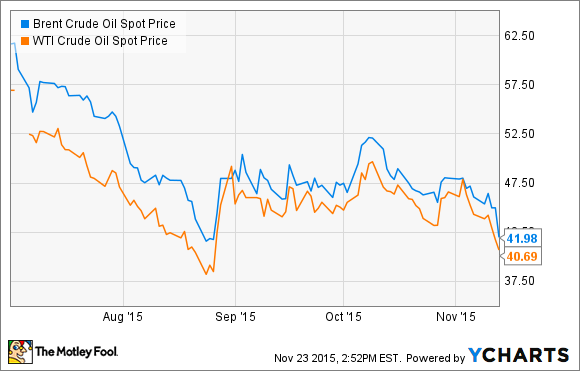 ConocoPhillips' bottom-line results and cash flows have been killed by low oil prices. 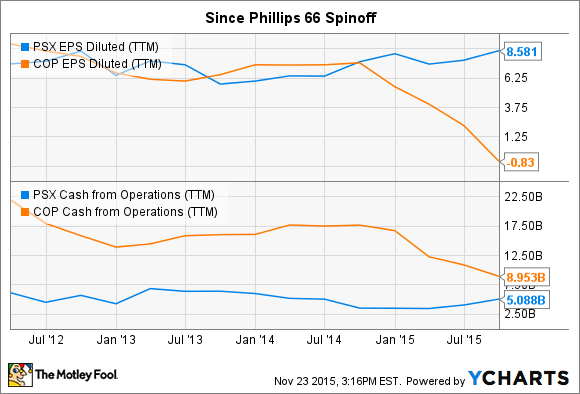 Is Phillips 66 right for your portfolio? I'm a big fan of Phillips 66, and a shareholder, and I'm far more likely to buy more shares than I am to sell. However, it may not be the right stock for every investor. If you're looking for big, fast growth, there are probably better stocks to buy. But if you're looking to invest in a company that pays a strong dividend that is likely to increase it regularly, this is a great company to own. You can also expect steady (if not fast) growth, especially in the company's petrochemicals and pipeline businesses, which are set to benefit from plentiful and cheap American natural gas. However, don't make the decision wholly because of Buffett's big spending recently. After all, Buffett showed us earlier this year that he can turn on a dime, when Berkshire sold its $3.7 billion stake in ExxonMobil less than two years after first buying shares. Just a reminder -- invest for your own reasons. Buffett may be the greatest living investor, but his goals and priorities may be different than yours.